Stickers and iron-on patches with different themes, not included in the other categories. Sticker (patch) with the shape of a bow tie in black color.Content: 1 iron-on sticker.Diameter: approx. 60 mm.Material: Textile. Sticker (patch) with the shape of a black tie with sequin stripes.Content: 1 iron-on sticker.Diameter: approx. 70 mm.Material: Textile. Sticker (patch) with the shape of a man's hat, in black color with a sequins stripe.Content: 1 iron-on sticker.Diameter: approx. 94 mm.Material: Textile. Sticker (patch) with the shape of a pair of glasses in black color.Content: 1 iron-on sticker.Diameter: approx. 85 mm.Material: Textile. Sticker (patch) with the shape of a black moustache.Content: 1 iron-on sticker.Diameter: approx. 69 mm.Material: Textile. Stickers (parches) with the shape of a pair of eyes (left and right)Content: 2 stickers iron-on.Diameter: approx. 50 mm. each eye.Material: Textile. 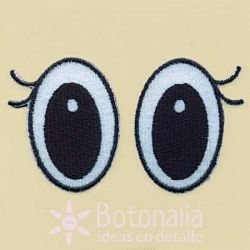 Stickers (parches) with the shape of a pair of eyes (left and right)Content: 2 stickers iron-on.Diameter: approx. 40 mm. each eye.Material: Textile. Stickers (parches) with the shape of a pair of eyes (left and right) in green color.Content: 2 stickers iron-on.Diameter: approx. 35 mm. each eye.Material: Textile. Sticker (patch) in a rectangular shape with a print of the text BLUE Label over a dark blue background.Content: 1 iron-on sticker.Diameter: approx. 52 mm.Material: Textile. Sticker (patch) in a square shape with embroidery with the sign Basicline over a blue background.Content: 1 iron-on sticker.Diameter: approx. 43 mm.Material: Textile. Stickers (patches) of rectangular shape, one with the print HANDMADE over a pink background and another one with the sign DESIGNED FOR YOU over a green background. Content: 2 stickers iron-on.Diameter: approx. 55 mm.Material: Textile.